It’s 10:30am and I’ve already eaten breakfast, and gotten a workout in. Instead of trying to face some kind of New Years Resolution that will inevitably end in failure I’ve decided to take on #OneWord365 . Forget about Resolutions, this is a promise to myself. A life lived with intention to fufill my One Word. 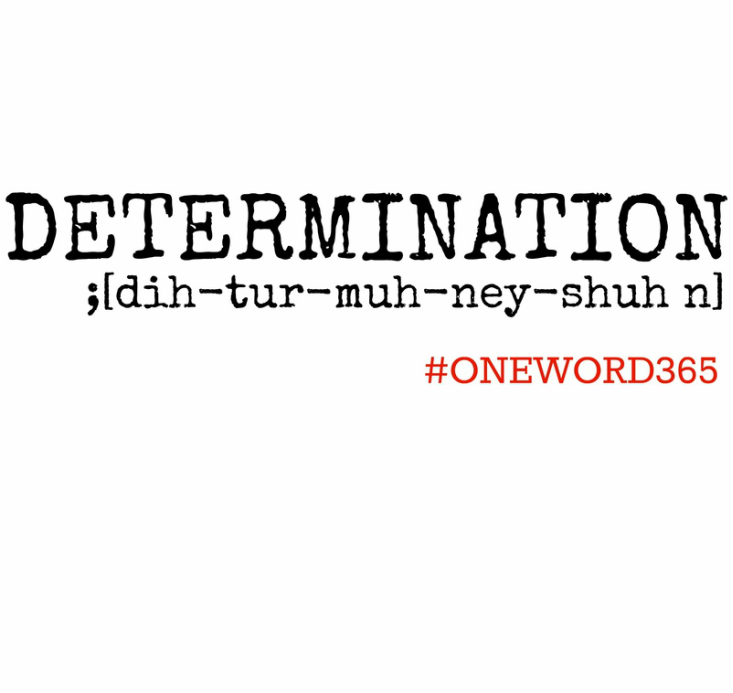 Out of all the words in the english language I chose to live this year with Determination. the act of coming to a decision or of fixing or settling a purpose. the quality of being resolute; firmness of purpose. My favorite line? “Push until you can’t and then demand more!” those lyrics will resonate in my life. Pushing, and demanding more, more of myself, more of my time, more of my focus, more of all of me in all areas of my life. 2015 brings Determination in several areas. 1. My health: I am about 100+ lbs over weight. Before I had my son I successfully lost about 40lbs in 6 months. I now weigh more then when I was 9 months pregnant, and have a strong desire to have another baby, however I refuse to have another at the weight I am now. To many risks to the baby and myself. My weight holds me back from a lot with my son, I can’t be as active as I’d like, my energy is slim to none on most days, and my overall health though seemingly OK now has the potential to develop into a myriad of deadly diseases. I never want my son to think I’ve chosen food over him. 2. This blog: I want it to be successful, I would love to see it monetize and help provide for my family, I would love to see my husband be able to quit his job(s) so we could spend time together as a family and have the time and money to take vacations- our last vacation was our honeymoon over 5 years ago, 2 days at Disney (which is about 2hrs from us) but more then money I want to see it help people, I want people to be inspired to cook, I want them to know they aren’t alone when it comes to the wild world of parenting. 3. My relationships: I want to invest in my relationships. With my husband I want to spend more time with him, one on one, connecting, instead of simply existing. With my son, I want to make time to play with him, not just sit there, but be an active and important part of his play. And with my other relationships, family & friends I want to be there more, be more attentive, and be more intentional. 4. A new business venture: I am in the works of opening a new online store. Preparing, planning, building, designing, and spreading the word will be work! 5.God: I want to depend on God again, I know that growing in him will allow me to grow and have success in the other areas I’ve listed. I know that it’s a lot, I know it’s going to take work, but I am determined to change my life. If you could choose one word for 2015 what would it be, answer in the comments section below.